It was sure nice to be able to take four days off after the campaign's completion. The whole experience was exhilarating and at the same time very demanding. A few weeks before I launched The Saga of Rex on Kickstarter, I took on a small project (a 16-page comic story called "LOAH") from editor Kazu Kibuishi and Amulet/Abrams Books. In my naivety, I had planned to do this task while running the Kickstarter campaign. Little did I realize that I'd be so involved trying to get The Saga of Rex funded that everything else would go by the way side. From now until the end of January, I will be creating original art, prints, sketches, signing books, and setting up the Secret Production Blog, while at the same time completing "LOAH". 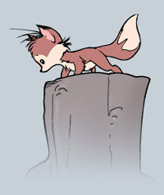 My intention is to start production on The Saga of Rex: The Animated Film by, February 11, 2013. The Secret Production Blog will also go into action on that date or a bit earlier. Thanks again for all your support. This is going to be fun! 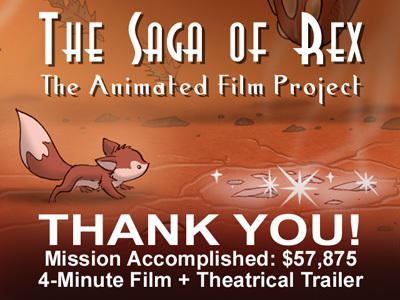 The Saga of Rex Gets Funded! It's with excitement, anticipation and trepidation, that I'm announcing my Kickstarter Campaign to finance the first four minutes of my proposed Animated Feature Film, The Saga of Rex. Please have a look at the plan I laid out and the cool rewards available. I'm hoping to make a valuable contribution to the art of Classical Animation. I hope you'll be with me on this journey. Visit my Kickstarter page here. I always enjoy sharing my experience with students and peers, and it looks like I'm going to do quite a bit of that in the coming weeks. First, on Monday, October 17th, I'll be giving a one-day master class (in French, no less), in Québec City at l'École Nationale en Divertissement Interactif (ENDI). The following day, I'll be giving a three-hour talk at Squeeze Animation also in Québec City. On Wednesday, November 14th, I'll give a talk to the students of Chapman University in Orange County, California. Then, I will be a guest speaker at CTNX in Burbank, California, from November 16-18. I will be doing a workshop, on the 16th from 6:30 PM to 9:00 PM, called, Create Your Own Video Game From Concept to Completion. While at CTNX I'll also do a signing and be part of a panel discussion called, Designing for Games vs Features, Graphic Novels and or Apps. ZED: A Cosmic Tale will be published by Image Comics next year in April, but I thought I'd offered 10 advanced copies at the show. I'm really happy with the book and I can't wait to share it! If you make it early enough, you might be able to get one of these pre-release copies which I will gladly sign for you. Otherwise, you'll have to wait til next April to get your copy! When creating ITSP, a lot of our early prototypes ended up on the cutting floor, as you can see from our 2007 trailer (http://youtu.be/kx_qAzX1DyU). This was one of my favorite prototype that got cut, and I wish we could have worked it out in the final game. Although the prototype played very smoothly, the video capture is a bit choppy, but unfortunately, that is all that remains from this. After finishing Insanely Twisted Shadow Planet, I pretty much concluded that the time had come to start migrating away from Animo—a software I had been using to create animation since 1993. Not only, did I use it, I actually helped develop it. I even spent time in Cambridge, UK, working with the programming crew. I used Animo for Prelude to Eden, Sensology, The Iron Giant, Ratatouille and many more. A few years ago, Cambridge Animation, who developed and supported Animo, went out of business. I still had my portable license of the software but knew that the end was coming. I didn't want to switch software during the production of Insanely Twisted Shadow Planet, so I kept working with Animo for that project. 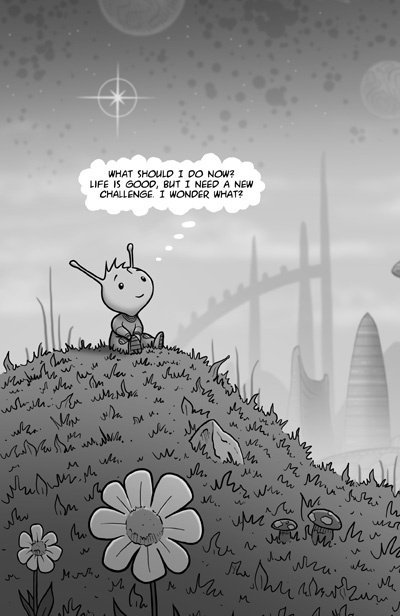 When ITSP was completed, I devoted my time to finishing a 280-page graphic novel (which will be coming out in the near future). And then, in early July, I was faced with deciding what to do next. 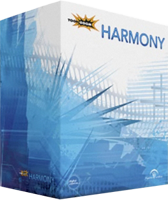 I knew that this was the perfect time to face my animation software dilemma. My "Toon Boom" test, done single-handedly in 3 weeks while learning the software. I will have a thorough review in a few days. While doing development for Pixar's Brave, production designer, Steve Pilcher, asked me to create a series of short animation tests. These were usually done over Steve's own pre-production paintings or color keys. The assignment on this one was to animate frost magically covering the landscape using Celtic patterns. This particular test was all animated in Adobe Photoshop. Camera move and compositing were done in Animo. 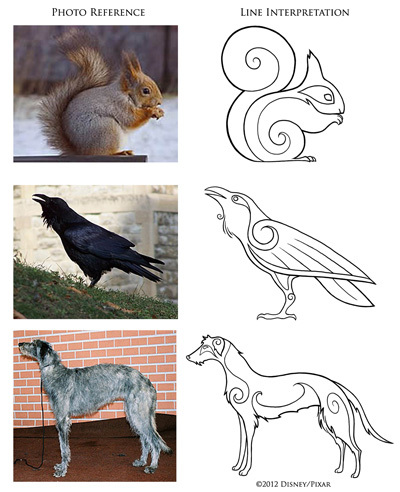 One of my assignments on Pixar's Brave, was to create a series of line drawings depicting various animals rendered in a celtic/pictish style. After doing some research, I came up with a whole menagerie. Although I didn't see any of these designs being used in the film, I was glad to see some of them being chosen for the Art of Brave book. Below you can see the line drawings next to the photographs that inspired them. More designs here. I'm back home from San Diego Comic-Con and I had a blast. A huge thank you to all my friends at Image Comics, Fantagraphics and Bolt City Productions, where I signed books and chatted with friends old and new. Here are a couple of pictures. 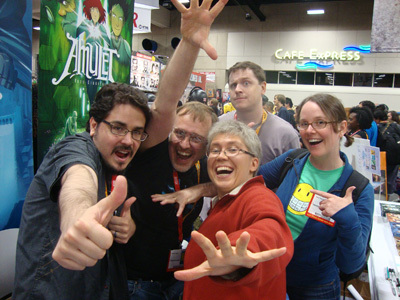 From left to right: Dave Roman, Me, Johane Matte, John Green and Raina Telgemeier having a hell of a time at the Boltcity Productions booth. 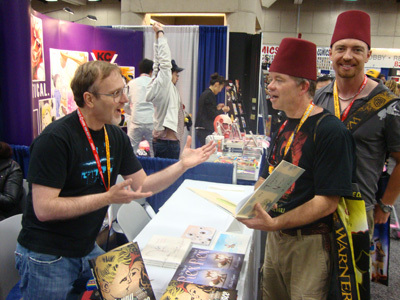 Signing at the Fantagraphics booth and chatting about comics with two Fez wearing chaps. I will be signing "The Saga of Rex" for Image Comics, and "Young Romance: The Best of Simon & Kirby's Romance Comics" for Fantagraphics. I'll have some other goodies with me but if you plan to visit and have a request for other items or books (see ordering page from my website) you'd like me to bring (and dedicate), send me an email (gagneint@aol.com) before the end of Wednesday, 11th, and I'll do my best to bring it for you. 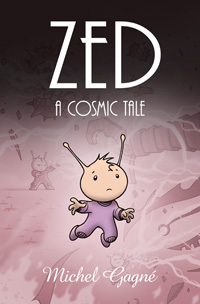 I just wrapped up ZED: A Cosmic Tale, a 280-page graphic novel. I self-published 10 issues of ZED in comic book form over the course of 11 years, and for the past five months, I’ve reworked, redrawn, re-scripted and expanded the whole series into a proper graphic-novel. I sent the files today to digital print on demand service, Ka-Blam.com, so that I could get a nice mock-up of the book to send Image Comics. Image did a good job publishing The Saga of Rex and I’m hoping they will be publishing ZED: A Cosmic Tale as well. 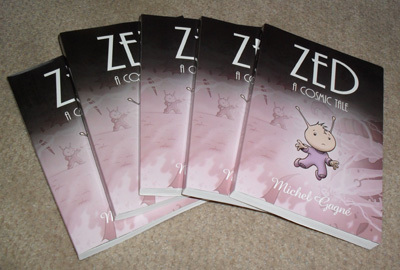 Now that the graphic novel is completed, I feel a little bit like ZED, on the last page of the story (see below).